Or, how to manage the brew temperature of your heat exchanger (HX) espresso machine. The E61 is one of the most popular espresso machine designs among home enthusiasts. Named after the year the patent was approved (a year of an eclipse), its gorgeously sculpted and highly polished group is recognized as a hallmark of fine espresso machines. The design of the E61 group also has well-earned reputation as the heart of an espresso machine that is forgiving of minor errors in barista technique. However, knowing how to maximize this forgiveness necessitates a certain understanding of how heat exchanger espresso machines work, as will be presented in the next section. If you're already familiar with these types of espresso machines, you may want to skip ahead to the main topic of this how-to, Managing HX Brew Temperature. This pretty much covers the full depth of my knowledge of our dishwasher's inner workings. There's little motivation to learn more because I don't see any practical use for acquiring the knowledge. In contrast, it is worth understanding the principles behind how your espresso machine works because this knowledge will guide your preparation techniques and that definitely has practical benefits—better espresso! How to produce powerful, abundant steam for frothing milk. How to get the group to the desired coffee brew temperature. If you're new to the espresso machine market, you may want to read Espresso Machines 101 before continuing. It briefly introduces three of the most common espresso machine boiler designs, namely single boiler, double boiler, and the focus of this article, single boiler / dual temperature, which are commonly called "heat exchangers" (HX). An intuitive appreciation for the workings of a single boiler espresso machines is easy. They have two thermostats, one for brew temperature and another for steam temperature. Flipping a switch chooses which controls the heating element. Dual boilers are even more obvious; they have one boiler for the coffee's brew temperature water and another for producing steam. Heat exchangers are an innovative, efficient design that defies such a brief explanation. To understand them more fully, let's address each of the questions above as they apply to such espresso machines. In essence, these requirements collectively pose the question, "How do heat exchanger espresso machines work?" Heat exchanger espresso machines rely on a heavy, highly thermally conductive metal group. Temperature-wise, think of the brew group as a chunk of brass having almost the same weight as a bowling ball and the few ounces of water for an espresso as an egg. This analogy really adds meaning to the notion of "thermal mass," wouldn't you agree? The heat exchanger, shown in the simplified schematic to the right as the tube passing through the center of the boiler, is responsible for warming the incoming fresh water to near the coffee's optimal brew temperature before it reaches the grouphead. Once all that solid brass is at the desired brew temperature, it acts as a dampener to either reduce the temperature of the incoming water if it's a little too hot, or raise it if it's a little too cool. Your goal is to get the group as close to precisely the desired brew temperature as possible so it can "fine tune" the somewhat volatile temperature of the water exiting the heat exchanger. This of course begs the important question that follows. The means by which the brew group arrives at the desired coffee brew temperature depends on the espresso machine's design. Many commercial machines rely on direct thermal conduction by attaching the group directly onto the boiler. Other machines, like those we're considering in this article, use a thermosyphon to circulate water from the boiler through the group, as shown in the schematic to the right. As the water in the heat exchanger portion of the loop warms (double lines), it rises and flows towards the group (red arrow). 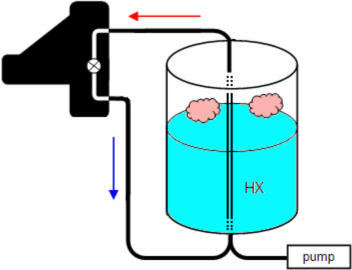 The water then cools and descends towards the bottom of the group (blue arrow), returning to the boiler where it reheats and repeats the circuit. The boiler itself is only partially full of water (or partially empty, depending on your point of view). The space above the water is filled with steam under pressure. Thus the boiler serves two purposes: Providing steam from the top portion for frothing milk and an easily regulated heat source to warm the water passing through the heat exchanger. The boiler pressure gauge indicates the amount of pressure, generally between 1.0 and 1.2 bar (one bar = 14.5 PSI). An espresso machine's boiler works under the same principle as pressure cookers by increasing the boiling point of water to higher than the 212°F one expects when heating water in a pan on the stove. The table to the left shows the actual water temperature at common espresso machine boiler pressures. The entire brew pathway heats up to some percentage of the boiler temperature as this "super hot" water circulates between the boiler and group. Since no system has 100% thermal efficiency, the final grouphead temperature is determined by its own heat loss and that of the copper tubing carrying water to it. In the case of most U.S. espresso lovers, their target brew temperature is around 201-203°F; for some countries overseas, the tastes are for a cooler 192°F. Manufacturers adjust the length and diameter of the tubing making up the thermosyphon loop to increase or decrease the efficiency of the circuit to arrive approximately at the desired brew temperature. Looking at the schematic, notice that the pump feeds into the same thermosyphon loop. To simplify the diagram, I've omitted valves and solenoids that direct water through the group and highlighted the heat exchanger portion of the circuit passing through the boiler. For most semi-commercial espresso machines, the heat exchanger is little more than a fat tube that traverses the boiler with part of it immersed in the super hot water and the rest exposed to only steam. The heat exchanger's job is to conduct some of the boiler's heat to the water being pumped towards the grouphead. One problem, however, is that being surrounded by water at no less than 250°F, it won't be long before the water inside the heat exchanger will also be super heated. Extracting an espresso using this water will blast the coffee with blistering hot steam and assure an extremely hot, bitter brew. Enter the most important HX ritual you'll ever learn: The HX cooling flush. The next section will introduce why, what, and how to ready an HX for brewing espresso. The essentials are covered in the first few paragraphs. Experienced baristas may wish to continue reading the rest of the section for a discussion of the thermodynamics behind these efficient and fascinating machines.